Jane Austen’s works are often classified as “romances.” The assumption comes from the premise that if the heroine meets a handsome man in Chapter One, he must be the hero. Fitzwilliam Darcy is the romantic hero of Pride and Prejudice, and although he does not appear in Chapter One, he does make an appearance by Chapter Three, and Austen’s chapters are short in comparison to contemporary writers. However, if you know nothing of the story line nor do you have sweet dreams of Colin Firth emerging dripping wet from a placid lake (Sigh!) or of Matthew Macfadyen walking through the morning mist with an open shirt and lots of chest hair (Sigh! ), you may not think much of the infamous Mr. Darcy. Quite frankly, upon our first meeting of this wonderful character, he is a jerk. He makes a horrendous “first impression.” But that is the thing with Austen. Her original title of the novel and her theme are one and the same: first impressions are misleading. From the first line of Pride and Prejudice, “It is a truth universally acknowledged that a single man in possession of a good fortune must be in want of a wife,” Austen plays a merry game with her readers. “First impressions” are misleading. Repeat that phrase with me: First impressions are misleading. First impressions are misleading. In truth, Darcy does not come to Hertfordshire seeking a wife; Wickham is not the perfect mate for Elizabeth; Jane might be more beautiful than Elizabeth, but she lacks her sister’s depth of character; Darcy’s best quality is not his wealth, nor is his worst quality his pride. Austen’s theme permeates every line, and, generally, the reader does not recognize that our favorite “Lady” hits us over the head with it. Readers simply sense the resonance found within Austen’s works. Theme explains why Austen’s works are considered “classics.” When I taught school, I used a thematic approach to the literature we covered in class. During the 15 years I spent at the middle school level, we identified common (and not so common) themes, which would tie the many novels we had available for our students together (humor, the Holocaust, science fiction which can become science fact, coming of age, etc.) Theme, well done, brings us universal truths, and discerning readers seek truth well told. Austen writes about the truths of a flawed society in which she was born. What we find in Austen, as well as in the Brontes, Dickens, Conan Doyle, Shakespeare, etc., is how easily her stories are transferred to the present. Critics of “remaking” the classics refer to the phenomenon as “nostalgia.” We who love these types of stories are accused of wanting to go back to a less complicated time. In reality, I disagree with the idea that the Regency was “less complicated,” but I understand their objections. Yet, it is much more than a longing for an easier time. If it is “nostalgia,” then what is missing from our current time that brings us to seek out another? It is more than an “escape” into the past. Readers and viewers return again and again to these tales. What parts of these remakes of the classics speak to our contemporary needs and fantasies? I believe, we often use a magnifying lens to view the world. This lens has a filter known as the “past.” We view contemporary society by reinventing the past. Some people would disagree with this idea, but I am of the persuasion we “soften” the difficulties of the Regency. Early romance writers have set the standard for the times. In contrast, I often write of the prejudice in society, the lack of rights of women, the devastation of being born second or third, the perils of being born first in a wealthy family, the prospects of the servant class, etc., but I can tell you, my works are received with mixed views, because some readers do not wish to know of the seedier side of the Regency. Parts of the past survive, while others fade away. From the perspective of current cultural and social ambitions, politics, and historiography, the past is remade. Do not our grandparents tell us of a simpler time? Do we not look back and see with our “selected” memory a past in which life moved as an easier pace? Yet, in truth, those easier times had issues similar to those of which we deal every day. Death, famine, disease, betrayal, corruption, war, etc., exist in each era. As a writer of Austen-inspired novels, I strongly feel that I “hold” the past in waiting for my readers to cherish, but I also believe my novels, as well as those of other writers of remakes, reshape the past in the current styles and fashions. Remakes (whether sequels, adaptations, what ifs, different genres with Austen’s characters, etc.) appeal to both our need for the classics and our need for popular culture. As a teacher for 40 years, I repeatedly asked my students to read and view and analyze – to imagine themselves in relation to a past and an ever-changing present. As a writer, I reimagine Jane Austen’s works as a portal through which the reader can consider what we were, what we are, and what we want to be. In doing so, I emphasized the importance of permitting the canon and its past to be complemented by, and in some sense removed by, the tools and technologies of our contemporary culture and popular media. Often when I submit an Austenesque novel for a contest, I am told by a judge (who has never read such a novel) that I “cheated” because I used readily recognizable characters. I am “punished” by the score I am presented. I attempt to take the constructive criticism and use it, while ignoring the chastisements for my choice of characters. Despite the insinuations of my character for choosing Austen’s most famous couples, I say I have upped my writing because not only must I tell an engaging story, but I must also keep Darcy and Elizabeth and Anne Elliot and Captain Wentworth true to the nature set for me by Jane Austen. In such adaptations, those of us who delve into these remakes, retain the specifics of the context and the historical setting, while highlighting and exploring current issues. As I mentioned above, in my many Austen sequels/adaptations, I have used political intrigue, issues of race, women’s rights, the plight of the poor, post traumatic stress syndrome, childbirth, governmental spies, etc. These issues fit the historical setting, but they also speak to modern times. So, how popular are these remakes? How easily have Jane Austen and others made the journey into contemporary times? In 1995, A&E Network aired an Andrew Davies’ retelling of Pride and Prejudice. It earned the network its highest rating ever in the U.S. In England, 21% of British viewers watched the last episode of this series, which starred Colin Firth and Jennifer Ehle. Sales of Pride and Prejudice hit 35,00 copies per week during the broadcast. In the past twenty years, there have been more than 30 films and TV adaptations of Austen’s works, as well as over 500 continuations and sequels based on Austen’s six simple novels. Multiple markets have grown up around the love of Jane Austen: music to read Austen by; boutiques; guidebooks; cookbooks; dolls; advice books; organized tours, etc. Book Blurb: Liz Bennet’s flirtatious nature acerbates Will Darcy’s controlling tendencies, sending him into despair when she fiercely demands her independence from him. How could she repeatedly turn him down? Darcy has it all: good looks, a pro football career, intelligence, and wealth. Pulled together by a passionate desire, which neither time nor distance can quench, they are destined to love, as well as misunderstand, each other until Fate deals them a blow from which they can no longer escape. 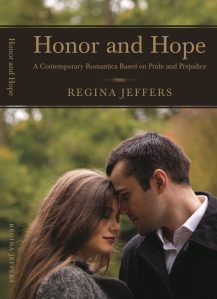 Set against the backdrop of professional sports and the North Carolina wine country, Honor and Hope offers a modern romance loosely based on Jane Austen’s Pride and Prejudice. This entry was posted in film, Jane Austen, language choices, Living in the Regency, Napoleonic Wars, Pop Culture, Pride and Prejudice, Regency era, Regency personalities, word play, writing and tagged classics, Honor and Hope, Jane Austen, modern adaptations. Bookmark the permalink.